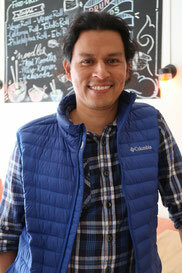 He went to Uniandes Chef School and then took up the position as Chef in Zumo. Through self-studying he has specialized in Japanese cooking techniques and even speaks some Japanese, as well as English and French. Ivan’s favorite song is “Digital Bath” by the Deftones. 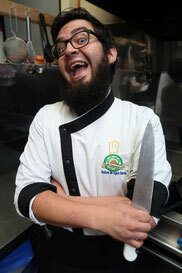 As a child he had three professions he wanted to pursue: Forensic doctor, psychologist or chef. He is a chef now, so his greatest fear is that he can’t keep on cooking as this is what he really loves! In his free time you can find him walking around town enjoying a good coffee. He is responsible for the day-to-day business of the restaurant and greeting customers with a smile, serving our Chef’s delicious food. 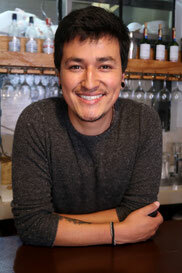 His most embarrassing moment working at Zumo occurred on one of the very first days after opening the restaurant, when a customer asked him for the ingredients of the California Roll. As he wasn't sure, he just said it was made with Sushi rice and said nothing else... If he had a super power, it would be being able to travel back in time. His favorite phrase: Everything happens for a reason! Thinking about how to best use the mouth-watering vegetables and fruits his parents produce on their farm half an hour outside of Baños, he came up with the idea of opening his own restaurant – Zumo Food & Drink! He is passionate, a hard worker, an optimist, perseverant and emphatic. His most treasured possession is his family, which he visits often on one of the many family fiestas. His perfect holiday would be in a place where he can find good food, wine and a great spot to enjoy a sunset. It should also be near to the mountains so he can go hiking or rock climbing – his favorite outdoor activities. Melanie is from Germany and moved to Ecuador for love. 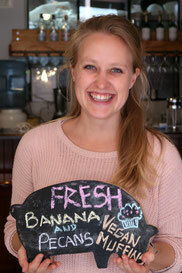 She is responsible for making the desserts, administering the website and helping in service. If she could go back in time, she would visit places like Stonehenge, the Easter Islands or Machu Picchu to see how people lived back then and constructed those magical monuments. She would love to have the power to read people's thoughts.